been introduced to describe and measure the surface free energy of materials with applications to wood systems. Depending on the surface to be examined and the selected test liquids, several methods are available for calculation of the surface energy of a solid. The earliest studies were based on critical surface tensions (Timmons and Zisman 1968), followed by the two liquids concept of harmonic (Gardner 1996, Maldas and Kamdem 1999) and geometric means (Gardner 1996; Owens and Wendt 1969), the equation of state (Neumann et al. 1974), and the Lifshitz-van der Waals/acid-base theory based on three liquids (Van Oss et al. 1988; Volpe and Siboni 1997; Wålinder 2002). Sanding is a crucial process in the woodworking industry, as it determines the surface adhesion strength of coating films and the final perceived wooden esthetic product. A sanded wood surface is characterized by small uniform scratches that are more favorable for stain performance than are planed and sawn surfaces (Tan et al. 2012). A good understanding of the sanding effects is essential to achieve the desired surface quality and the optimum bonding strength at machining conditions. The sanding process influences not only the roughness, but also the surface chemistry components, i.e., contact angle and surface free energy (El Abed et al. 2012). Multiple studies have reported that smaller contact angles (indication of good adhesion and improved wettability) were obtained after sanding of wood surfaces. (Sinn et al. 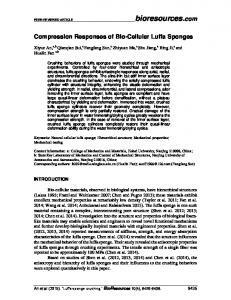 2004) investigated the chemical and morphological changes that occurred at spruce and beech wood surfaces when they are sanded using different grain sizes. The wettability, coating ability, and bonding strength may be affected by aging time. (Gindl et al. 2004) studied the effects of ageing on beech and Norway spruce wood surfaces using contact angle measurements combined with X-ray photoelectron spectroscopy. 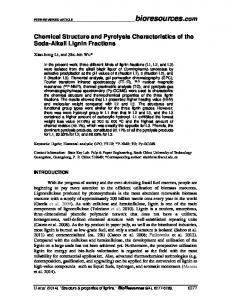 (Wålinder 2002) studied the Lewis acid-base properties of pine wood by contact angle analysis. Wood can be viewed as a porous, heterogeneous, complex material comprised of cellulose, hemicellulose, lignin, and extractives, and these polymeric compounds are arranged in a cellular structure resulting in surface roughness on a microscopic scale (Gardner et al. 1991), so the equilibrium contact angle of liquid on the wood surface is hard to determine. There are two major effects, Wenzel showed an equilibrium effect of fine-scale roughness; the Wenzel equation shows how the presence of fine-scale roughness tends to amplify differences in contact angle relative to 90-degree angles (Huh and Mason 1977). The other main class of effects is due to contact angle hysteresis (Chibowski 2005). The contact angles assumed as equilibrium contact angle investigated in the study were acquired by linear regression method; the obtained contact angle is quite unlikely to be precisely true on a wood surface. The theory relating contact angle results to roughness was not considered in the present work but might be considered in future studies. Most of the studies have focused on the surface free energy calculation of sanded wood or the aged wood, however, the surface free energy of fresh and aged wood (fastgrown poplar wood, especially) after sanding with varying grit numbers has rarely been studied. The aim of this work is to investigate the roughness of sanded poplar wood and the effects of sanding with different grit number and aging on the surface free energy of fast-growing poplar wood. Additionally, the different methods used to calculate the surface free energy were compared using contact angle measurements. EXPERIMENTAL Materials Fast-growing poplar used in the experiment was obtained from a local woodworking factory (Hebei, Wen’an County). The average poplar density was 408 kg/m3, with a standard deviation of 26 kg/m3. Samples were cut parallel to the grain direction and under control conditions of temperature and relative humidity of 20 °C and 65%, respectively. The samples were first planed and then sanded with varying grit numbers (60, 120, 180, and 240) 40 times parallel to the sample. After sanding, the wood dust was carefully cleared. The sanded samples were then left to age for 10 days in air, and the fresh wood samples were only sanded without ageing. Only heartwood was used to avoid experimental error between the sapwood and heartwood. The final dimensions of the samples were 100 mm × 25 mm × 3 mm. Methods Surface roughness According to DIN 4768 (1990), the roughness parameter Ra (arithmetic mean of the deviations from the absolute values of the mean line profile) was measured using a Surtronic 3+ roughness tester (Taylor/Hobson Company, England) with a 20-μm-radius diamond stylus tip. The measurement angle used was 90º, and the evaluation length was 12.5 mm. The measurement results were processed using a digital Gaussian filter. 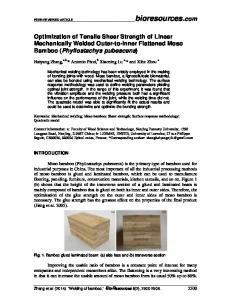 Eight to ten wood samples were used for roughness measurement, and the unevenness error did not exceed ± 10%. Image Analysis Images of the surfaces of sanded wood samples parallel to the grain direction were obtained using scanning electron microscopy. An S-3400N (Hitachi, Japan) scanning electron microscope (SEM) operating at a 10-kV acceleration voltage was used to visualize the surfaces. Prior to imaging, samples were coated with gold-palladium in a sputter coater (E-1010, Hitachi, Japan) Contact angle measurement The contact angle measurements on the tangential surfaces of the samples were performed with an optical contact angles apparatus (OCA 20 DatapPhysics Instruments GmbH, Filderstadt, Germany) equipped with a video measuring system that included a high-resolution CCD camera and a high-performance digitizing adapter that enables instantaneous and frequency registration. SCA 20 software (DatapPhysics Instruments GmbH, Filderstadt, Germany) was used for data acquisition. Sessile droplets (3 μL, measured with a microsyringe) of liquids (for diiodomethane, 1.5 μL) were placed on the wood surface; the right and left angles of the drops on the surface were collected at intervals of 0.1 s for a total duration of 60 s, and the average of the angles was calculated. A minimum of 10 droplets was examined for each wood sample. In this study, three reference liquids were used. All the contact angles were observed parallel to the macroscopic fiber orientation. The contact angles of fresh wood were detected within 10 min after sanding treatment; therefore, the possible treated surface aging is minimized. 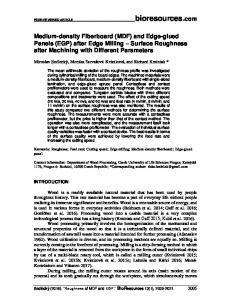 RESULTS AND DISCUSSION Morphology and Contact angle Surface roughness is an important property in terms of surface quality, particularly in finishing treatments (Buyuksari et al. 2011). The surface roughness of the wood surface could be affected by sanding treatment. The roughness parameter (Ra) was used to examine the surface roughness of poplar wood samples (Nemli et al. 2007; Sulaiman et al. 2009; Nadir Ayrilmis 2010). The contact angle of water and measured roughness parameter are shown in Table 1 and Fig. 2, and Fig. 1 shows the surface structure morphology. Figure 2 indicates that the roughness parameter (Ra) decreased as the grit number increased. The changes in Ra values sanded by grit numbers of 120, 180, and 240 were slight. The sample sanded with the grit number of 180 had the smoothest surface, with an Ra value of 4.57 μm. Conversely, the control sample, with a Ra value of 8.43 μm, was the roughest surface. Figure 1 shows that the sample sanded with a grit number of 180 had the smoothest surface, the control sample was found to have a large number of destroyed vessels compared to the sanded samples, and fibrillation was seen on the samples, especially for samples sanded with grit numbers of 120 and 240. The sanding process can effectively reduce the wood surface roughness, although the change was not evident when the grit number increased from 180 to 240, which might be due to the irregularities from planing not being totally removed by the very fine grit number of 240. When sanded with 60 grit, the depth of vessels on the wood surface became shallower than the control wood, and the vessels disappeared when the grit number increased from 120 to 240. The wood surface sanded with 180 grit had the smoothest surface, and no fibrillation was found on the wood surface. Generally, the larger grit number corresponded with smaller roughness. 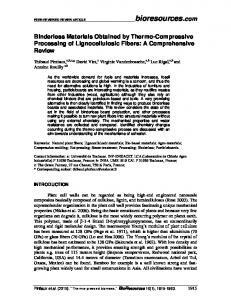 It is commonly reported and agreed that grit size affects the surface roughness i.e., a higher grit size produces a finer sanded surface (Fujiwara et al. 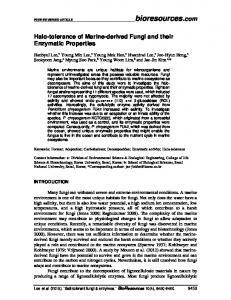 2005; Hendarto et al. 2005; Gurau et al. 2007). hydrophobic groups from the interior to the exterior may be the primary reason for this. At an Ra value of over 120, the contact angle changes were not evident. Surface Free Energy Components Figure 3 depicts the surface free energy of fresh and aged wood samples calculated by the Zisman method (Timmons and Zisman 1968). It can be seen that the surface free energy of control wood (fresh and aged) was smaller than the sanded wood samples, and the surface free energy of aged wood increased with increasing grit number, but the change was not remarkable. As seen in Fig. 3, one can also conclude that the surface free energy of aged wood was larger than that of fresh wood, in accordance with the contact angle trend, in which the contact angle for aged wood samples was larger than that for fresh wood samples. Therefore, the data obtained by the Zisman method (Timmons and Zisman 1968) might be unsuitable, as indicated in many studies (Gardner 1996; Gindl et al. 2004; Maldas and Kamdem 1998) and by the following empirical statement: “Lower surface free energy would have a higher contact angle, and meanwhile, higher surface free energy would have a lower contact angle” (Baldan 2012). There is no doubt that the surface free energy calculated from the contact angle using the Zisman method (Timmons and Zisman 1968), OWRK method (Owens and Wendt 1969), and vOCG method (Van Oss et al. 1988) showed wide variations. Zisman (Timmons and Zisman 1968) himself always emphasized that the critical surface free energy is not the surface free energy, but only an empirical parameter related closely to this quantity (Baldan 2012). For fresh wood, the critical surface free energy according to the Zisman method (Timmons and Zisman 1968) is systematically 30 to 40% lower than that calculated by the OWRK method (Owens and Wendt 1969). A similar occurrence was observed by Maldas and Kamdem (1998) and Gindl et al. (2001a). However, for aged wood, the changes in surface free energy among the Zisman method (Timmons and Zisman 1968), OWRK method (Owens and Wendt 1969), and vOCG method (Van Oss et al. 1988) were not evident (Fig. 4 and Table 3). 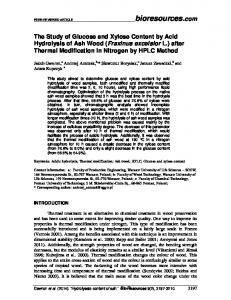 due to the reorientation of functional groups in the wood-air interface and oxidation. These results agreed with results from Wålinder et al. (2002). The surface free energy of wood samples obtained using the liquid parameters from Volpe and Siboni gave a better balance between the acid component and base component (Volpe and Siboni 1997; Wålinder 2002). CONCLUSIONS 1. The roughness parameter (Ra) decreased as grit number increased. Therefore, the sanding process can effectively reduce the wood surface roughness; no change was evident for a grit number increase from 120 to 240. 2. The contact angle of water on the fresh wood samples decreased as the grit number increased. The fresh wood surface was more easily wetted by water than was the aged wood sample. The contact angles increased as the surface roughness decreased. 3. The surface free energy of sanded aged wood obtained by Zisman model may not be relevant. 4. For the fresh wood samples, the change of surface free energy and its component were not remarkable when the grit number was higher than 120; for the aged wood samples, the disperse component increased as the grit number decreased but not remarkably. 5. The effect of roughness on the acid-base components, acid component, and base component (calculated using the vOCG method) were unremarkable. The surface free energy of wood samples (obtained using the liquid parameters given by Volpe and Siboni (1997)) can effectively balance the relationship between the acid and base components. ACKNOWLEDGMENTS This research was supported by the Fundamental Research Funds for the Central Universities (No. TD2011-12) and the National Natural Science Foundation of China (Project 31000268/C160302). 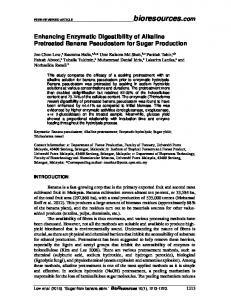 REFERENCES CITED Ayrilmis, N., Candan, Z., Akbulut, T., and Balkiz, O. (2010). "Effect of sanding on surface properties of medium density fiberboard," Drvna Industrija 61(3), 175-181. Baldan, A. (2012). 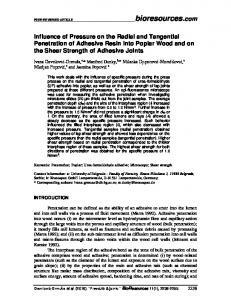 "Adhesion phenomena in bonded joints," International Journal of Adhesion and Adhesives 38, 95-116. Buyuksari, U., Akbulut, T., Guler, C., and As, N. (2011). 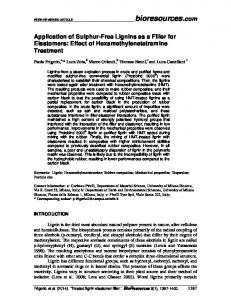 "Wettability and surface roughness of natural and plantation-grown narrow-leaved ash (Fraxinus angustifolia Vahl.) 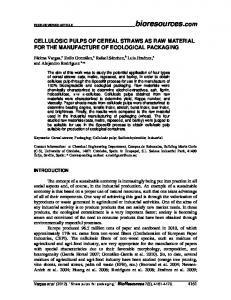 wood," BioResources 6(4), 4721-4730. Liptakova, E., and Kudela, J. (1994). "Analysis of the wood-wetting process," Holzforschung 48(2), 139-144. Liptakova, E., Kudela, J., Bastl, Z., and Spirovova, I. (1995). 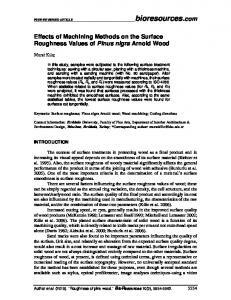 "Influence of mechanical surface-treatment of wood on the wetting process," Holzforschung 49(4), 369-375. 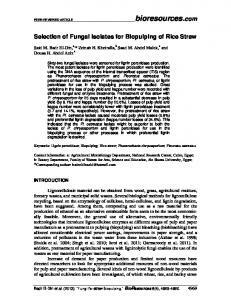 Liu, F. P., Rials, T. G., and Simonsen, J. (1998). "Relationship of wood surface energy to surface composition," Langmuir 14(2), 536-541. Maldas, D. C., and Kamdem, D. P. (1999). 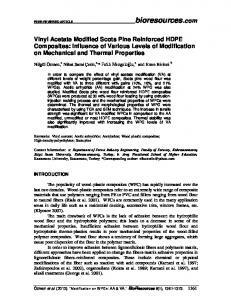 "Wettability of extracted southern pine," Forest Products Journal 49(11-12), 91-93. Mamiński, M. Ł., Mierzejewska, K., Borysiuk, P., Parzuchowski, P., and Boruszewski, P. (2009). 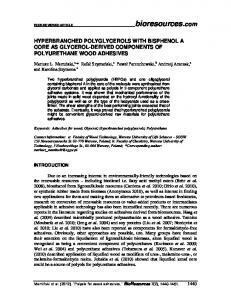 "Surface properties of octadecanol-grafted pine veneers," International Journal of Adhesion and Adhesives 29(8), 781-784. Nemli, G., Akbulut, T., and Zekovic, E. (2007). "Effects of some sanding factors on the surface roughness of particleboard," Silva Fennica 41(2), 373-378. 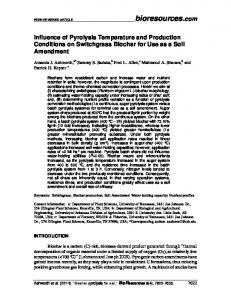 DOI: 10.14214/sf.302 Neumann, A. W., Good, R. J., Hope, C. J., and Sejpal, M. (1974). "An equation-of-state approach to determine surface tensions of low-energy solids from contact angles," J Colloid Interface Sci 49(2), 291-304. Nzokou, P., and Kamdem, D. P. (2004). 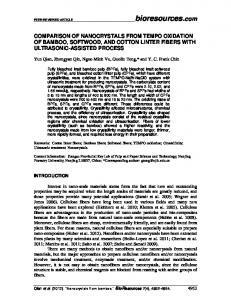 "Influence of wood extractives on moisture sorption and wettability of red oak (Quercus rubra), black cherry (Prunus serotina), and red pine (Pinus resinosa)," Wood and Fiber Science 36(4), 483-492. Nussbaum, R. M. (1999). "Natural surface inactivation of Scots pine and Norway spruce evaluated by contact angle measurements," Holz als Roh- und Werkstoff 57(6), 419424. Owens, D. K., and Wendt, R. C. (1969). 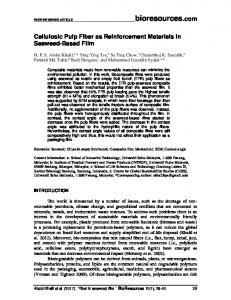 "Estimation of the surface free energy of polymers," Journal of Applied Polymer Science 13(8), 1741-1747. Santoni, I., and Pizzo, B. (2011). 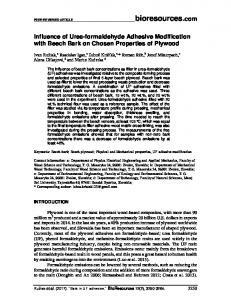 "Effect of surface conditions related to machining and air exposure on wettability of different Mediterranean wood species," International Journal of Adhesion and Adhesives 31(7), 743-753. 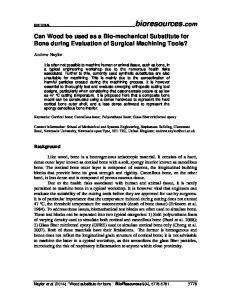 Sinn, G., Gindl, M., Reiterer, A., and Stanzl-Tschegg, S. (2004). 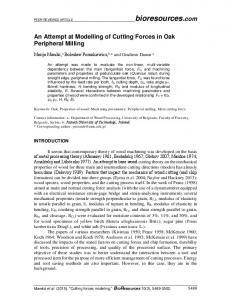 "Changes in the surface properties of wood due to sanding," Holzforschung 58(3), 246-251. Sulaiman, O., Hashim, R., Subari, K., and Liang, C. K. (2009). "Effect of sanding on surface roughness of rubberwood," Journal of Materials Processing Technology 209(8), 3949-3955. Tan, P. L., Sharif, S., and Sudin, I. (2012). 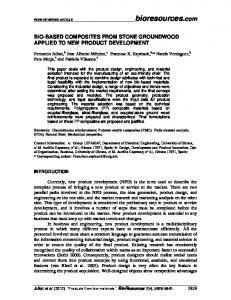 "Roughness models for sanded wood surfaces," Wood Science and Technology 46(1-3), 129-142. Timmons, C. O., and Zisman, W. A. (1968). "The relation of initial spreading pressure of polar compounds on water to interfacial tension, work of adhesion, and solubility," J. Colloid Interface Sci. 28(1), 106-117. Van Oss, C. J., Good, R. J., and Chaudhury, M. K. (1988). "Additive and nonadditive surface tension components and the interpretation of contact angles," Langmuir 4(4), 884-891. Volpe, C. D., and Siboni, S. (1997). "Some reflections on acid–base solid surface free energy theories," J Colloid Interface Sci 195(1), 121-136. Wålinder, M. E. P. (2002). 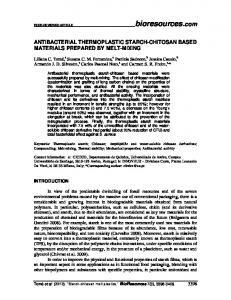 "Study of Lewis acid-base properties of wood by contact angle analysis," Holzforschung 56(4), 363-371. Wålinder, M. E. P., and Gardner, D. J. (2000). "Surface energy of extracted and nonextracted Norway spruce wood particles studied by inverse gas chromatography (IGC)," Wood and Fiber Science 32(4), 478-488. Wålinder, M. E. P., and Strom, G. (2001). "Measurement of wood wettability by the Wilhelmy method - Part 2. Determination of apparent contact angles," Holzforschung 55(1), 33-41. Article submitted: March 10, 2014; Peer review completed: May 22, 2104; Revised version received and accepted: December 9, 2014; Published: December 16, 2014.